In the past few years, advances in surgical techniques have improved outcomes in varicose veins treatment. The aim of this retrospective study was to determine whether the use of laser and different parameters influenced morbidity rates and the learning curve for all technology improvements during the period. From 2009 to 2018 we performed 366 vein procedures using endovenous laser technique for varicose veins. During this period, negative outcomes diminished with adoption of new strategies and skills. Laser wavelength, radial fibre, ultrasound guidance, anaesthetic intumescence, laser power and energy, and hospital setting were changed during the evaluation period. Laser technology requires many parameter adjustments, there is an understandable steeper learning curve at first. The use of new strategies and improved procedure steps allowed us to achieve a significant improvement in morbidity rates in the group of patients operated on using the 1,470 nm laser and in later quintiles. Vascular & Endovascular Review 2018;1(1):22–6. The treatment of symptomatic varicose veins results in significant improvements in quality of life and has been shown to be cost effective.4,5 In recent years, the standard approach to treating saphenous vein insufficiency has been changing to the use of less-invasive techniques such as sclerotherapy, radiofrequency or endovenous laser ablation (EVLA) in suitable patients.6,7 Laser and radiofrequency ablation are currently well-established endovenous treatments.4 In the last decade, the use of EVLA has increased in popularity, with short- and medium-term results comparable to, and in some reports superior to, traditional surgery.8 Furthermore, in the past decade, many small improvements in technical procedure have been shown to influence outcomes. While radiofrequency does not have many parameters for adjustment, EVLA technique has many intraoperative adjustments that can change outcomes.9 Compared with radiofrequency and other techniques, EVLA has more variables to be fine-tuned to achieve better results. Almost all studies that have been published on EVLA show high success rates (>90 %), independently of laser wavelength,10 but failed to assess evolution of procedural changes. In the last few years, advances in surgical techniques have improved outcomes in laser treatment. Currently, the method proposed by most of the published papers in this area uses tumescent ultrasound-guided peri-venous anaesthesia, because it is done in ambulatory care, which has the advantages of collapsing the treated vein during laser fire and protecting the adjacent tissue from burning. However, reaching this definition took a long time and numerous studies. When evaluating such outcomes in institutions that have only recently begun to systematically treat this condition, particular attention should be paid to the learning curve and to the constant updating of methods in accordance with the newest surgical strategies. In this study we offer an analysis of the cases we have treated, together with a description of the evolution of our therapeutic approach as our experience in the treatment of varicose veins and venous insufficiency has increased. We sought to evaluate the usage of laser for treatment of venous insufficiency using EVLA and fine-tuning of its parameters. The aims of this study were to compare efficacy, early postoperative morbidity rates and patient comfort associated with the use of two laser wavelengths and to define improvements in treatment strategy that enhanced outcomes, such as fibre types and use of tumescence or not in treatment of saphenous vein incompetence resulting in varicosities of the lower limb. 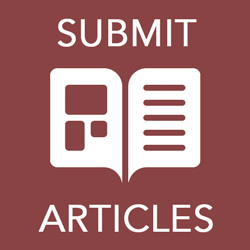 We undertook a retrospective review of a service database to assess the efficacy of different wavelengths and protocols for EVLA for treatment of saphenous vein insufficiency and perforators. All consecutive patients with saphenous vein insufficiency treated by our staff during the revision period were considered for the study. Only those who formally agreed to undergo EVLA and signed informed consent were included in the study. Between 2009 and 2018, thermoablations using endovenous laser were performed in 366 veins from 245 patients by the same surgical team. The mean age was 48.2 years (range 18–82 years), and there were 66.9% (n=164) female participants. Inclusion criteria was patients undergoing laser ablation for great saphenous vein small saphenous vein (SSV) and perforators. Previous to February 2012, all venous ablations were performed using the 980 nm laser (group I). Subsequent to February 2012, ablations were performed using the 1,470 nm laser (group II). The primary outcome was the vein occlusion confirmed by ultrasound. Secondary outcomes included procedure-site complications, such as thrombophlebitis, ecchymosis/haematomas, paresthesia, long-term paresthesia, postoperative pain, inflammation, hyperchromia, occlusion rate and deep vein thrombosis. All group I EVLA procedures were performed using 980 nm wavelength diode laser (Synus Laser) in the continuous mode at 12 W of power with a linear endovenous energy density (LEED) of 80 J/cm (calculated postoperatively). Tumescent perivenous infusion of cold saline solution was initially not ultrasound guided. A bare-tip 600 mm laser fibre was inserted through the 4F sheath. The tip of the laser fibre was positioned 1–2 cm below the saphenofemoral junction without ultrasound guidance, but confirmed by direct visualisation of the red-aiming beam through the skin and being 5 cm below inguinal line. Laser energy was applied using the laser’s continuous mode and a constant pullback with the aim to achieve 80 J cm LEED. Catheter pullback at a rate of 2–3 cm/min was not monitored. First cases did not have ultrasound monitoring, but after the initial attempt it was clear that ultrasound guidance was required and was then included in the technique. Group II used 1,470 nm wavelength laser (Innova Touch Duo, Orlight Laser) in continuous mode at 5 W (later 7W) of power with 80 J/cm LEED. A 6F sheath was placed over the guidewire and a radial Saturn/Biolitec fibre was advanced under ultrasound guidance to the saphenofemoral junction, and then withdrawn to just distal to the orifice of the superficial epigastric vein. No tumescent infusion was performed at first, but partial and total tumescence was later included. The surgical technique for group II employed has been fully described elsewhere.3 Variables in EVLA treatment include laser wavelength, laser power, fibre pullback speed, fibre type, tumescence, inpatient/outpatient facility and anaesthesia technique. The patients of the first 196 veins treated were exclusively given with spinal and general anaesthesia; they underwent the EVLA procedure under intravenous sedation with oxygen supplementation and spinal anaesthesia in hospital care at first. Procedures initiated by an ultrasound-guided percutaneous access at calf level with the patient in a reverse Trendelenburg position and a tourniquet to maximise vein diameter. After the first 196 cases, local anaesthesia with sedation was introduced. In both groups, after removing the fibre, closure of the vein was confirmed by ultrasound and deep veins were accessed for thrombosis evaluation. Concomitant phlebectomies were performed in both groups as needed and an eccentric compression bandage was applied over the course of the treated vein for 24 h in the first half of cases, and surgical 35 mmHg socking (Struva 35, Medi) in the second-half cases. Betamethasone injection was applied after the initial 20 cases. Patients then wore graduated compression stockings (20–30 mmHg, thigh-high) during the following 1 month during the day. Prophylactic low-molecular-weight heparin was not routinely used in either group, only for high-risk patients. Patients were advised to walk regularly during recovery from treatment and non-steroidal anti-inflammatory drugs were prescribed for pain relief. At 3–7 days, postprocedural duplex ultrasound was performed to assess the status of vein occlusion and thrombosis. Saphenous veins were isolated to assess results of vein ablation, and deep veins were studied for presence of thrombosis. Venous access is usually obtained under ultrasound guidance by puncturing the vein with 16G or 18G needles or 6F sheath introducers at the distal point of reflux, often the medium third of calf.13 The next important step in the EVLA procedure is positioning the tip of the laser fibre 2–3 cm distally from the saphenofemoral junction (SFJ), using ultrasound guidance. In case of treatment of an SSV, the fibre tip is usually propagated towards the popliteal vein as long as the SSV still remains at the immediate subfascial level. Depending on the length of the treated vein, about 250–500 mL of tumescent local anaesthesia (TLA) is injected perivenously under ultrasound guidance. TLA usually contains 1 mg epinephrine, sodium bicarbonate, and 500–700 mg lidocaine or half lidocaine and half bupivacaine per 1000 mL saline solution. We introduced a mechanical infusion pump recently, which is highly recommended. TLA is warranted because it reduces pain, cools perivenous tissue and decreases the venous diameter.3,10 Moreover, it provides anaesthesia for several hours after the intervention and allows early discharge. A precooled TLA may enhance the analgesic effect14 and we also use external compression with ice. Before releasing laser energy, patient position is changed to Trendelenburg for diminishing even more vein diameter and avoiding bubble embolisation. During the release of laser energy, the laser fibre is pulled back centimetre by centimetre for achieving a 60–100 J/cm LEED, using a previously described method for precise LEED calculation,3,10 depending on its diameter and distance from nerves. Initial ablation requires higher energy. LEED consists of power x time/distance, or W x s/cm. Measuring LEED, although imperfect, takes in four important variables of laser treatment: power, time, distance and, consequently, energy. As wavelength is fixed, this amounts to control over five of the variables in the procedure9. An endovenous fluence equivalent of at least 25 J/cm2 is recommended to achieve a sustained occlusion15 and it is calculated by dividing LEED by the vein circumference in cm. Patients were scheduled for clinical and ultrasound assessments at 7 and 30 days after EVLA. Ultrasound was used to confirm EVLA failures and occlusion rate during the follow-up period. Clinical failures were defined as the finding of measurable venous reflux in the treated segment, with or without recurrent varices, either clinically symptomatic or asymptomatic. All clinical and ultrasound examinations were carried out by medical doctors, in a standardised fashion. To assess the incidence of clinical failures, both the side effects of EVLA (i.e. paresthesia, varicophlebitis, pigmentation, etc.) and the evolution of symptoms or signs affecting the patients before the procedure (i.e. heaviness, edema, skin changes, presence of visible varices, etc.) were systematically recorded at each follow-up visit, as applicable. Ultrasound assessments were performed by an experienced vascular physician, employing an Accuson X300 ultrasound machine (Siemens), equipped with 7.5- to 10.0-MHz linear probes. Testing was carried out in orthostatism, following a standardised protocol. First, the saphenous junction competence was assessed, defined as absence of venous reflux, or presence of venous reflux lasting for <1 second after Valsalva or augmentation (i.e. muscle squeezing) manoeuvres. Second, the saphenous trunk patency was assessed. If, despite EVLA, the trunk was still patent, then its diameter was recorded, and venous reflux, if present, evaluated with Valsalva and augmentation manoeuvres. Finally, varicose veins were evaluated to distinguish between residual or recurrent varicose veins, the latter defined as refluxing varices fed by an unsuccessfully treated venous segment. Descriptive statistics were calculated for all variables. 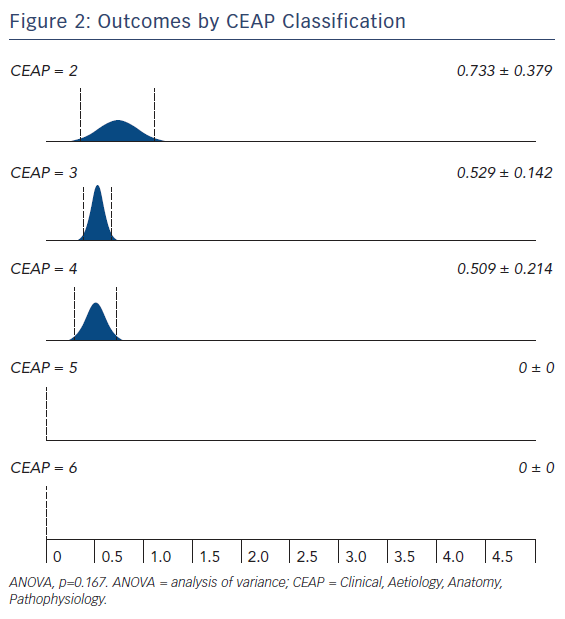 Variables included in the analysis were age, gender, ‘C’ of CEAP (Clinical, Aetiology, Anatomy, Pathophysiology) classification and already-mentioned outcomes. Quintiles were calculated by software. Data on the preoperative, intraoperative and follow-up periods were collected for all patients referred to our department with this pathology since 2009 and recorded in a secure database. After manual verification of the consistency of the data, descriptive and statistical analyses were conducted. Characteristics recorded as categorical data were expressed as absolute and proportional frequencies. Statistical analyses employed the t test, the chi-square test, analysis of variance (ANOVA) and Pearson correlation test. Multivariate statistical analysis of data was conducted using Excel (Microsoft) and Wizard 1.9.20 (Evan Miller) programs. Characteristics recorded as quantitative data were expressed as means, with standard deviations and ranges16 (p<0.05 was considered statistically significant). Laser thermoablations were performed on a total of 366 veins among group I (n=28) and group II (n=312), and one case of a 1,940 nm laser. Patient demographics were similar between the two groups (Table 1). The incidences of postoperative pain, inflammation and ecchymosis were significantly greater in group I versus group II (p<0.001 for all). Whereas, the incidence of occlusion rate was significantly greater in group II (p=0.001). Incidences of paresthesia and symptomatic thrombophlebitis were non-significantly greater in group II. Long-term paresthesia, hypercromy and deep vein thrombosis were only noted group II (Table 2). Successful percutaneous access and endovenous placement of the laser fibre were achieved in all patients and were well tolerated. All patients in both groups were subdivided in quintiles and number of negative outcomes were added for each patient as points, this created a learning curve as shown in Figure 1B. The first quintile had 0.875±0.243 points in negative outcomes, the second quintile 0.622±0.194 points, the third quintile 0.458±0.189 and the fourth quintile 0.122±0.073 (Figure 1A). This represented a trend toward lower negative outcomes in later quintiles (Figure 1B). When grouped by CEAP classification, negative outcomes sum points are 0.733±0.379 for C2, 0.529±0.142 for C3, 0.509±0.214 for C4 and zero for C5 and C6 (Figure 2). 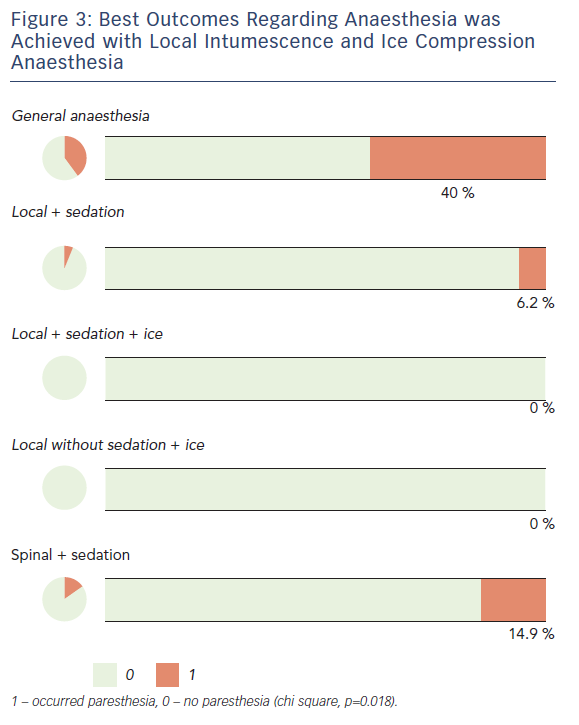 Paresthesia incidence was lower after inclusion of intumescence anaesthesia (Figure 3): 40 % of cases in general anaesthesia, 6.2 % with local anaesthesia and sedation, 14.9 % in spinal anaesthesia and sedation, and no paresthesia in local anaesthesia with ice compression with or without sedation. Varicose vein variability has led to use of a classification system for chronic venous disorders (CEAP), as follows: C0 (no varicose veins), C1 (telangiectasias and reticular varicose veins up to 4 mm in diameter), C2 (trunk varicose veins), C3 (oedema relating to varicose veins), C4 (skin pigmentation), C5 (healed venous ulcer) and C6 (active venous ulcer).17,18 Worse outcomes were found in lower Cs, but with no statistical significance; this trend could probably occur due to less preoperative symptoms and higher aesthetical expectations in lower clinical classification, but it would require a different methodological approach to highlight this tendency. In our cohort, postoperative complications were rare and mild, confirming the good safety profile of EVLA. There was only one case of deep vein thrombosis, which caused a pulmonary embolisation (0.4 %; 95 % CI [0.1–2.3]); this patient subsequently developed thrombophilia. He was assisted in intensive care for 1 week and discharged with good health. Differences between 980 nm and 1,470 nm EVLA pain have already been noted19 and was clear with outcome differences noted in group I and II in our experience. This could be due to the learning curve or worse outcomes associated with 980 nm ablation. Adoption of new strategies and improvement of procedure steps requires a new adaption time. This study suggests that our current strategy and technique has a lower rate of negative outcomes, and that EVLA has a steep learning curve. Our current best results are due to 1,470 nm wavelength laser, radial fibre with centimetre markings, usage of steroids and fine-tuning LEED. Ongoing evaluation is required to validate these results and to affirm the long-term durability of this technique. Campbell B. Varicose veins and their management. BMJ 2006;333:287–92. Porter JM, Moneta GL. Reporting standards in venous disease: an update. International Consensus Committee on Chronic Venous Disease. J Vasc Surg 1995;21:635–45. Amato ACM, Santos RV, Amato SJTA. Doença Venosa Crônica. In: Amato ACM. Cirurgia Vascular: O que você não pode ignorar. 1st Edition. São Paulo: Amato - Instituto de Medicina Avançada, 2017. ISBN 9781513624709. Shepherd AC, Ortega-Ortega M, Gohel MS, et al. Cost-effectiveness of radiofrequency ablation versus laser for varicose veins. Int J Technol Assess Health Care 2016;31:289–96. Oliveira RÁ, Mazzucca ACP, Pachito DV, et al. Evidence for varicose vein treatment: an overview of systematic reviews. Sao Paulo Med J 2018; pii: S1516-31802018005010101. Spreafico G, Piccioli A, Bernardi E, et al. Six-year follow-up of endovenous laser ablation for great saphenous vein incompetence. J Vasc Surg Venous Lymphat Disord 2013;1:20–5. Beale RJ, Gough MJ. Treatment options for primary varicose veins--a review. Eur J Vasc Endovasc Surg 2005;30:83–95. van den Bos R, Arends L, Kockaert M, et al. Endovenous therapies of lower extremity varicosities: a meta-analysis. J Vasc Surg 2009;49:230–9. Amato ACM, Amato SJTA. EVLTraining®: aplicativo para treino do cálculo da densidade de energia endovenosa linear. J Vasc Bras 2016;15:134–7. Proebstle T, van den Bos R. Endovenous ablation of refluxing saphenous and perforating veins. Vasa 2017;46:159–66. Dexter D, Kabnick L, Berland T, et al. Complications of endovenous lasers. Phlebology 2012;27(Suppl 1):40–5. Kerver AL, van der Ham AC, Theeuwes HP, et al. The surgical anatomy of the small saphenous vein and adjacent nerves in relation to endovenous thermal ablation. J Vasc Surg 2012;56:181–8. Amato ACM, Amato SJ de TA. Termoablação com Laser de Safenas. In: Procedimentos Médicos: Técnica e Tática. Rio de Janeiro: Roca, 2016; 157–160. Dumantepe M, Uyar I. Comparing cold and warm tumescent anesthesia for pain perception during and after the endovenous laser ablation procedure with 1470 nm diode laser. Phlebology 2015;30:45–51. Proebstle TM, Moehler T, Herdemann S. Reduced recanalization rates of the great saphenous vein after endovenous laser treatment with increased energy dosing: Definition of a threshold for the endovenous fluence equivalent. J Vasc Surg 2006;44:834–9. Moraes IN, Amato ACM. Metodologia da pesquisa científica. São Paulo: Roca, 2007. Gloviczki P, Gloviczki ML. Guidelines for the management of varicose veins. Phlebology 2012;27:2–9. Doganci S, Demirkilic U. 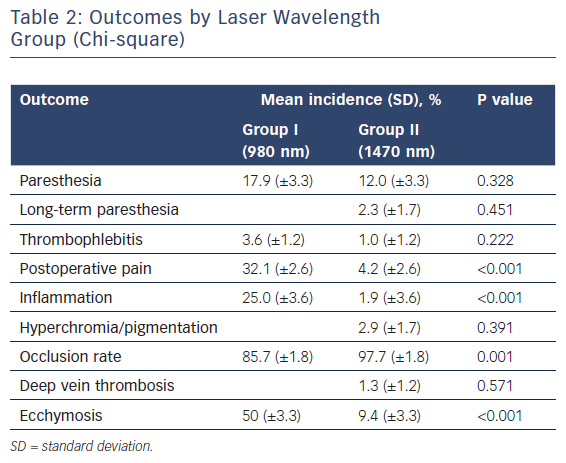 Comparison of 980 nm laser and bare-tip fibre with 1470 nm laser and radial fibre in the treatment of great saphenous vein varicosities: a prospective randomised clinical trial. Eur J Vasc Endovasc Surg 2010;40:254–9.